Covering the Police is a collaboration with U.C. Berkeley’s Graduate School of Journalism. 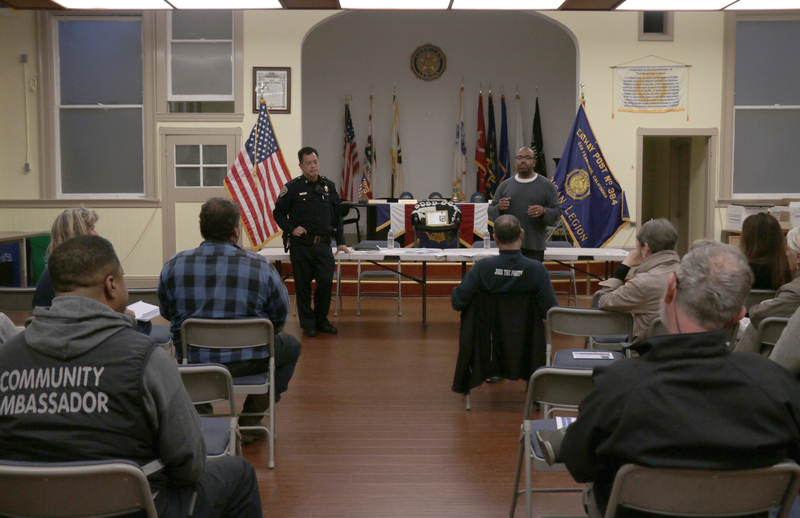 The Central Station police meeting Thursday evening was supposed to cover crime and homelessness throughout the entire police district. Instead, concerns over two people dominated the 75-minute session. One was a woman who hangs out around the 1700 block of Sacramento Street, allegedly offering drug-laced cigarettes to fellow homeless people, community members said. The other, a man residents identified as “Timothy,” spends his time around Polk and Clay streets and the nearby Whole Foods, where he allegedly acts violently. Tensions flared as several of the meeting’s two dozen attendees described incidents in which they said the man and woman were attracting drug crime and threatened bodily harm. “He has physically assaulted people,” said a sharply dressed man. Multiple times throughout the meeting at the Powell Street veteran’s center, Central Station Capt. Paul Yep and frustrated community members interrupted each other as they attempted to get their concerns across. At one point, Sandberg left her chair and pretended to run toward another community member, shouting threats and expletives, to demonstrate Timothy’s behavior. Yep’s point, meted out between the back-and-forth of exasperated meeting-goers, was this: Officers respond to all the calls they can, but legal and procedural hurdles limit the actions police can take. After more than 30 minutes, a frustrated Yep finally attempted to respond in detail. The Central Station answers 911 calls in fewer than five minutes on average, Yep said, noting that the SFPD responded to over 20,000 calls between Jan. 1 and Sept. 1 to check on the wellbeing of a person. Yep pointed out that he cannot arrest people unless they are acting out in front of police. And the police can’t press charges; that’s the job of Assistant District Attorney Charles Bisesto, who Yep said could not attend the evening’s meeting due to a scheduling conflict. “We share your frustration,” one attendee told him, asking how the community could mobilize to reduce the threat of the man and woman and improve the homelessness situation in general. One woman suggested folks contact their representatives at City Hall. “Calling your politicians goes a long way,” she said over a small chorus of skepticism. “It doesn’t mean just calling them once, it means — ” but she was drowned out by more clamor. A woman from the back broke in. If police spent enough time patrolling, “you would see this,” she said, referring to the growing numbers of mentally ill and threatening homeless people. “All you have to do is walk around the neighborhood, and you’d see it 10 times,” the woman added. At the start of the meeting, Randy Quezada, from the city’s Department of Homelessness and Supportive Housing, tried to assure meeting-goers that his agency is working to address the challenges of homelessness. On any given night, there are some 7,500 sheltered or unsheltered homeless people in San Francisco, according to Quezada. Supervisorial District 3, which encompasses most of the area of Central Station, is home to around 400 unsheltered individuals, according to this year’s Point-in-Time count. Quezada, who was invited to lead a dialogue on homelessness, discussed the department’s services and outreach efforts, and its goal of cutting the number of chronic homeless in half. Last fiscal year, San Francisco increased its spending on homelessness and supportive housing to $275 million. Residents have to work alongside his department, the SFPD and other community organizations to address concerns around homeless residents, Quezada said. But when he finally had the chance to speak at length again, meeting-goers had already made their concerns known, and more than half of the attendees were filing out. Did anyone mention that there are over a thousand people on the single adult shelter waitlist? Or that the average wait for a child/family to get into a shelter is 111 days? Or was the discussion focused on having to see poor people who are forced to sleep on the street because we are in a housing crisis? There are so many laws being broken – if police were patrolling like the one attendant said, they would see constant crime. Period. More than a quarter billion city dollars handed to a few hundred people who come from all over the US to camp, poop, panhandle, rob and get high on our sidewalks. People who can’t, or won’t, function as independent adults. Zero money spent on helping city residents working low wage jobs, or responsible citizens barely hanging on in The City. Simple math equation: Give money to people who live on the street and commit crime, and take more money from people who actually live and work here. What is the result? Dysfunctional people move to SF, functional people are forced to Oakland. That’s smart City policy!